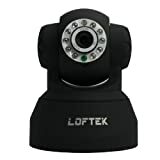 LOFTEKÂ® CXS 2200 Wireless/Wired Pan:270Â° & Tilt:120Â° Dual Audio Alarm Ip camera,15 Meter Night vision,3.6mm Lens ,67Â° Viewing Angle, Easy installation. Black. LOFTEK® CXS2200 is designed for high-definition network surveillance.It uses MJPEG video encoding standards to produce high-quality video and audio.The camera supports local recording as well as picture snapshots,and all of the functions-video capture,image processing,video transmission,management are all integrated into the camera,which facilitates installation and use. -Can not access wireless connection. 1.Do router settings parameters( wireless SSID and Encryption)should keep the same as camera wireless setting. 2.You should have router support wifi,so that you can connect camera wireless if want to view the camera remotely,just do port forwarding.